For many steel grades microalloying with niobium is the key to achieve their characteristic property profile. Microalloyed HSLA steels were among the first high strength steel grades used in vehicle construction. In some recent passenger cars they account for up to 40% of the body mass. Modern vehicle bodies make intensive use of high strength steel grades to meet the contradicting demand of lighter weight and simultaneously better mechanical performance. For many steel grades microalloying with niobium is the key to achieve their characteristic property profile. In HSLA steels, niobium enhances the strength primarily by grain refinement. In interstitial free high strength steels niobium serves as a stabilizing element. Some modern multiphase steels rely on niobium to achieve additional strength via grain refinement and precipitation hardening. Microstructural control constitutes a powerful means to further optimize properties relevant to automotive processing such as cutting and forming. The microalloying characteristics of niobium will now be further considered. Microalloyed HSLA steels were among the first high strength steel grades used in vehicle construction. In some recent passenger cars they account for up to 40% of the body mass. A high yield ratio and thus a low work hardening potential is characteristic of these steel grades. This can be advantageous in achieving the specified minimum yield strength in the component, as the local yield strength is rather insensitive to the level of deformation induced during forming. Other characteristics of HSLA steel are the quasi-isotropy (Δr-value ~ 0) and a good fatigue resistance. HSLA steel is typically used for the manufacturing of parts with low and medium geometric complexity such as members, reinforcement structures and chassis components. The low alloying content and the limited carbon content in particular reduces the hardness in the heat affected zone after welding processes with a fast cooling speed. HSLA steel is available as hot-rolled and cold rolled material. Cold rolled sheet can be produced by batch and continuous annealing in most of the existing cold rolling mills. As a result, there is a broad availability of this material including a wide range of dimensions and surface treatments. Additionally, the content of solid solution strengtheners like Mn and Si, Niobium is by far the most effective element for increasing the recrystallization stop temperature. A typical finishing temperature is about 875°C and the coiling temperature is around 600°C for all Nb-alloyed grades in order to optimize precipitation hardening. 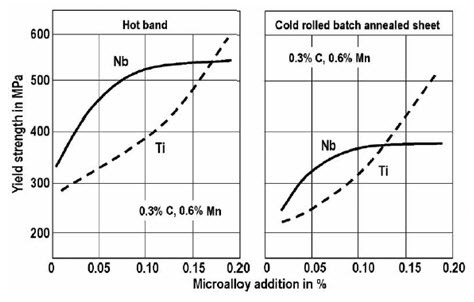 The microalloying of cold-rolled grades utilize maximum precipitation hardening in the hot-rolling mill. 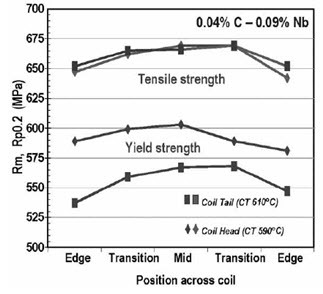 To achieve a yield stress of more than 400 MPa, additional microalloying of Ti is usually applied (Figure 5). The target for the heat treatment is to recrystallize the brittle cold-rolled microstructure without enlarging the precipitations. For a given chemical composition, hot-rolled material always has a higher strength value when compared to cold-rolled material (Figure 5). A recent approach to produce microalloyed hot rolled strip of 500 MPa minimum yield strength was successfully put into practice by reducing the carbon content (0.0459 and increasing niobium content (0.09%). Besides an extremely fine grained ferritic-bainitic microstructure, very low scattering in the mechanical properties within the coil and across batches was obtained (Figure 4). Particularly the narrow scattering of the yield strength is helpful to avoid spring back. The sheet edges are particularly smooth after mechanical cutting operations due to the ferritic-bainitic structure. Furthermore, the rather low carbon content also results in a reduced edge hardening when laser cutting is employed. Accordingly, this steel is well suited for forming methods where high peripheral stress is induced to sheet edge. This entry was posted in High Strength Steels. Bookmark the permalink.